After my first piece on the subject, I am continuing my trawl through the luxury London venues (well, someone has to do it!). 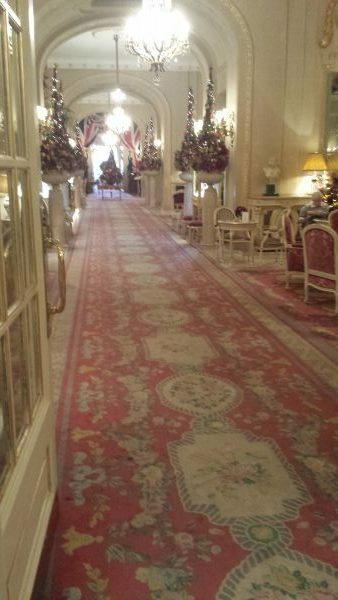 I paid a visit to the Ritz Hotel. My expectations were high, I confess. The reception I received was extremely friendly, although the elegance and opulence of my surroundings took my breath away! I was pleasantly surprised how quiet the building was, despite fronting on to Piccadilly. The decoration of the rooms is stunning, particularly in the part that, though only belonging to the hotel for about 10 years, is actually the oldest. The Ritz has three relatively informal rooms for smaller gatherings and one that takes about 75. One of the small rooms overlooks the Ritz’s own garden (I didn’t even know they had one!) and Green Park. The rooms cannot be said to be under-stated, and the ceilings are amazing! My visit certainly didn’t disappoint. Moving to Knightsbridge, my next port of call was The Berkeley. I’m not sure it actually announced itself with a sign outside, but perhaps it doesn’t need it! I was immediately struck by the service. Someone is employed to greet everybody entering the hotel and offer them help. As the hotel proved a little labyrinthine, this was welcome! This hotel too is being refurbished (January – March 2017), although it looked in excellent order to me! It has a ballroom, currently seating 100-180, which will be extended, and will accommodate nearer 220. As a celebrant, I was relieved that a microphone and built-in speakers are available as part of the package. The hotel has its own recommended suppliers, but, if the client prefers to bring someone in from outside, this is not an issue. This is a hotel with considerable style. By contrast, I went a little out of London (Elstree) to visit the Village Club Hotel. This is a very modern building with little of the character of the two others. However, it has its own atmosphere, and modern facilities (and, not least, free parking). Flexibility is the watchword, seemingly. The ballroom can fit in 180-200 maximum, but divides up, so smaller numbers can be accommodated. There is a terrace outside, which is available. There is also a reception area, as you come in, offering a private bar. The hotel will provide catering and the like, but, subject to certain conditions, welcomes outside suppliers. There are also smaller rooms that may suit cosier affairs. As your ever-obliging civil celebrant, I plan to submit one further review, and I hope to be offering useful service.